He looked, a prospective juror in a murder case once said, like "a little Santa Claus." At 74, Harry Riccobene, short and with a flowing white beard, resembled St. Nick only in appearance. One of the leading mafiosi struggling for power in the Philadelphia crime family during the brutal gang war of the early 1980s, Harry Riccobene was better known for hot lead slugs than holiday toys. The Philadelphia conflict started after the rubout of the longtime don of the Philly Mafia, Angelo Bruno, in 1980. Bruno had been murdered by New York Mafia elements who decided to terminate Philadelphia's traditional right to the rackets in Atlantic City. The New York mobs, especially the Genoveses and the Gambinos, felt it had been all right for Philadelphia to enjoy such primacy when the seashore city was in a state of decline, but the coming of the lavish and legal casinos altered that view. Atlantic City was now bigtime and the New York mobs moved in quickly and swatted Bruno away. 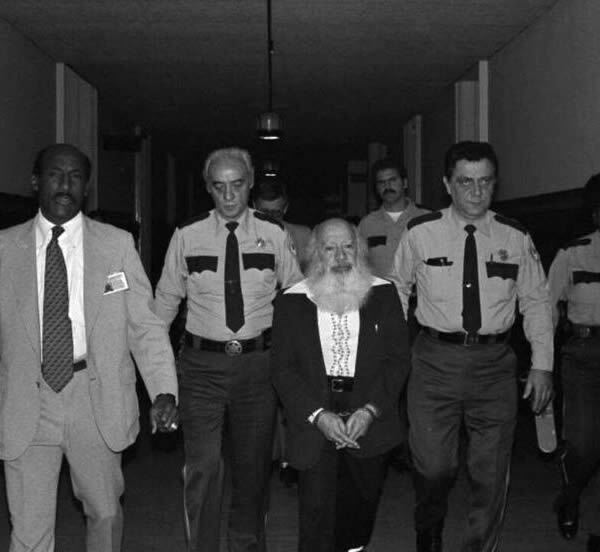 Bruno's successor, Chicken Man Testa, apparently also tried to resist New York; he was assassinated in 1981 by a remote-control bomb placed under his porch. Leadership now fell to Little Nicky Scarfo who had two worries—New York and the elderly, but murderously spry, Riccobene. As near as could be determined, Little Nicky reached an agreement with the New Yorkers in which rackets in Atlantic City were to be shared, if not on a 50-50 basis at least on one that gave Philadelphia something other than hot lead. Riccobene was another matter. There were going to be no compromises between the two sides. And Riccobene also wanted Atlantic City. The warfare that followed was byzantine. Riccobene gunners took out Scarfo capo Frank Monte, the number three man in the faction, with six bullets from a telescope-equipped rifle at a range of 100 feet. After several tries they also killed Salvatore Testa, the wild 28-year-old son of the late Chicken Man, snatching him, clad in tennis whites, as he was off for a match. (Young Testa had such a fearsome reputation that when he and two other Scarfo men took up posts outside the Philadelphia jewelry store of Riccobene's nephew, Enrico, the jeweler opted to commit suicide rather than come out to face them.) Riccobene lost his half-brother Robert who was cut down by a Scarfo gunner loping by in a jogging suit. However, the Monte killing easily constituted the most bizarre incident of all. It started out when Monte declared his faction was taking over Riccobene's lucrative loan-sharking and gambling business, said to be worth more than $550,000 a year. Monte approached Harry's half-brother Mario and demanded he set up his older half-brother for execution. Mario, in a temporary outburst of fraternal devotion, informed Harry of the plot. It was then that Harry Riccobene ordered Mario, and two dedicated hit men in his outfit, Joseph Pedulla and Victor DeLuca, "to get them before they get us." The killers waited for several hours in a camping van for Monte to appear and approach his Cadillac on a Philadelphia street. When he did, Pedulla later admitted he "poked the barrel of a gun out the van's back window" and pumped bullet after bullet into Monte. Unfortunately, Mario Riccobene, DeLuca and Pedulla were all arrested, for a non-fatal shooting of Salvatore Testa; other information linked them to the Monte killing. All three finally turned state's evidence in the Monte case when the prosecution agreed they would have to serve no more time than what they got for the Testa shooting. All three thus served up Harry Riccobene for sure conviction on first-degree murder charges. Harry took the witness stand to deny he sanctioned any murders. "I'm not a boss of anything," he said innocently. Why, he testified, he had advised restraint by his panicked associates when they expressed concern about death threats from the Scarfo side, which he characterized as nothing more than unfounded rumors. It was not an argument that impressed the jury very much. Perhaps the most intriguing testimony came from Mario Riccobene, who said he had decided, in part, to testify against his half-brother because that way he could hope to get free some day and be able "to get back at the people who did what they did to my family." It was evident that fraternal devotion was not dead in the Mafia although it could at times become somewhat murky in its application.